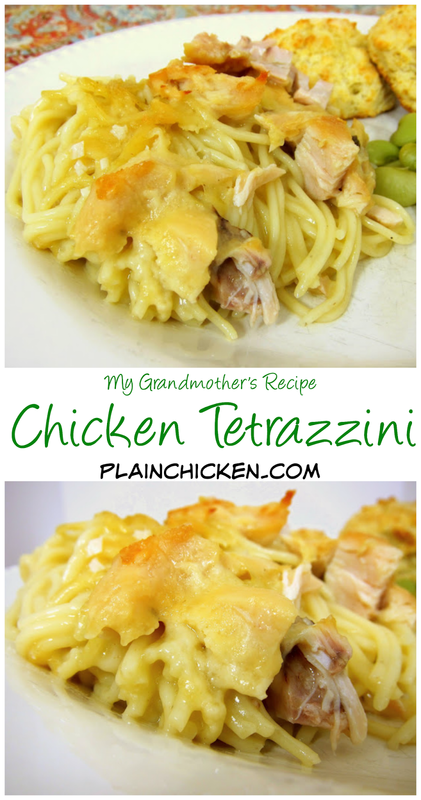 Chicken Tetrazzini Recipe - my Grandmother's recipe! Chicken, vermicelli pasta, cream of chicken and mushroom soup, chicken broth, parmesan cheese. One of my all-time favorite recipes. I can eat way too much of this stuff! Can make ahed and freezer for later. This is my take on one of our family's favorite recipes - Chicken Tetrazzini. My Grandmother and Mom would always make this the night before Thanksgiving and Christmas. I am not a big fan of turkey, so they would make this so I would have leftovers at the holiday feast. I absolutely love this dish. This is one of those dishes that I could eat myself sick on - doesn't everybody have one of those? This is so simple, but it is seriously delicious. To cut down on prep time, I use a whole rotisserie chicken. You can assemble this the night before and just pop it in the oven when you are ready. This also makes great leftovers and freezes well - which is good because this makes a ton! Chicken Legs' favorite part of the dish is the browned parmesan cheese crust on top. Remove skin from chicken and discard. Remove meat from the chicken and chop. Lightly spray a 9x13-inch pan with cooking spray. Layer 1/2 vermicelli, 1/2 chicken, and 1/2 of soup mixture. Sprinkle half of the parmesan cheese on the pasta. Repeat layers and top with remaining parmesan cheese. Cover with foil and bake for -1-1/2 hours. Yum!! I love chicken Tetrazzini. One of my favorite dishes!! I'm assuming you boil the pasta first? Do you boil the pasta first? Thanks! YUM, I made the potato casserole last night for dinner! Thanks for sharing all of these YUMMY recipes! My Husband is loving them too:O) Have a blessed day, HUGS! That is one of those old faithful recipes! @Laurie & doublegranny - Yes. 16oz vermicelli, cooked according to pkg directions. If you didn't use a rotisserie chicken, how many chicken breasts would you use? Shelly - it depends on the size - I would use 2 pounds of chicken breasts. So, 3 or 4 depending on the size. Do you use the grated parmesan in the green shaker or grated off a block? Is it really 90 minutes of cook time? I'm still willing to give it a whirl because this sounds DELICIOUS!! Mrs.O'C - I do cook it for 90 minutes. It is worth it - this is really delicious! Would ANY other noodle work for this? Like egg noodles? Yum!! I made this for dinner last night and it was a hit. Super easy to put together with things from the pantry, but had that loving, comfort food quality. For the leftovers tonight I sauteed some walnuts in butter and put those on before I reheated it in the oven. It was wonderful! Thank you! This is similar to a family favorite here. Can't wait to try your version. Also wanted to let you know you have your own board on my Pinterest because I love your recipes so much! Thanks for sharing! made this tonight - really delicious! i was impressed that it wasn't as high calorie as i thought when i put it into recipe calculator. thanks for a great recipe! next time i might try adding in veggies to make this a full meal casserole... has anyone else done that? I've never had chicken tetrazzini before, but this sounds amazing. Cooper absolutely loved it: "Mom, this is really good!" You have no idea how rare that comment is in our house. He even wanted to taked leftovers in his lunch today. Seriously... It says pasta: COOKED ACCORDING TO PACKAGE... Why ask if u are supposed to boil it first? This recipe has a lot of problems. First, 32 oz of broth is way too much, as is 16 oz of pasta. The liquid rimmed the edge of the 13 x 9 pan and caused runover in the oven. Dish was bland with no added salt or pepper. The pic clearly shows cheddar cheese, not Parmesan, and I will indefinitely not be making it again. Mine is baking in the oven right now. I can already tell I have a new potluck favorite. Could I put this together the night before and refrigerate? I am looking for dishes that I can do that with because I don't get home from work until 5:30 so I need food that all my husband has to do when he gets home is put it in the oven. Am I miss g sometjing? What do you do with the chicken broth? Do you mix it with the soups? yes - "Whisk together soups, chicken broth, and garlic powder." Do you use an already cooked chicken for this dish and then bake again for 90 minutes? Making this today, its in the oven. Smells so good!! SO sorry!!! I fixed the printable recipe. Thanks for letting me know! Made this this weekend, glad I did. Very yummy. I'll probably cut it in half next time though. My husband and I both ate it, pulled some for lunch and had half a casserole left over that I brought over to my dads for him to warm up and eat. Just made this and its delicious!